Giraffes are one of the world's tallest mammals. 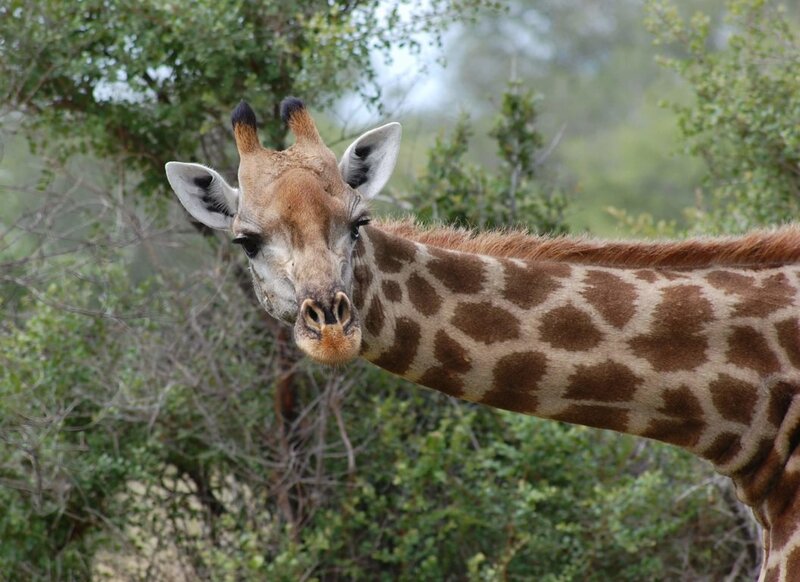 They are well known for their long necks, long legs, and spotted patterns. Giraffes have small "horns" or knobs on top of their heads that grow to be about five inches long. These knobs are used to protect the head in fights. Male giraffes are larger than females. Males weigh between 2,400 and 3,000 pounds and stand up to 19 feet tall. Female giraffes weigh between 1,600 and 2,600 pounds and grow to be 16 feet tall. Giraffes can be found in central, eastern and southern Africa. They live in the savannas of Africa, where they roam freely among the tall trees, arid land, dense forests and open plains. Giraffe populations are relatively stable. Their long necks help giraffes eat leaves from tall trees, typically acacia trees. If they need to, giraffes can go for several days without water. Instead of drinking, giraffes stay hydrated by the moisture from leaves. Giraffes are non-territorial, social animals. They travel in large herds that are not organized in any way. Herds may consist of any combination of sexes or ages. Female giraffes typically give birth to one calf after a fifteen-month gestation period. During the first week of its life, the mother carefully guards her calf. Young giraffes are very vulnerable and cannot defend themselves. While mothers feed, the young are kept in small nursery groups. Giraffes have spots covering their entire bodies, except their underbellies, with each giraffe having a unique pattern of spots. Giraffes have long necks, which they use to browse the leaves of trees. They also have slightly elongated forelegs, about 10% longer than their hind legs. Like nearly all mammals, a giraffe has seven neck vertebrae, which are extremely elongated. These bones produce bud like horns called ossicorns. Modifications to the giraffe's structure have evolved, particularly to the circulatory system. A giraffe's heart, which can weigh up to 24 lb, has to generate around double the normal blood pressure for a large mammal in order to maintain blood flow to the brain against gravity. In the upper neck, a complex pressure regulation system called the rete mirabile prevents excess blood flow to the brain when the giraffe lowers its head to drink. Conversely, the blood vessels in the lower legs are under great pressure (because of the weight of fluid pressing down on them). In other animals such pressure would force the blood out through the capillary walls; giraffes, however, have a very tight sheath of thick skin over their lower limbs which maintains high extravascular pressure in exactly the same way as a pilot's suit. Male giraffes determine female fertility by tasting the female's urine to detect estrus in a multi step process known as the Flehmen response. Giraffe gestation lasts between 14 and 15 months, after which a single calf is born. The mother gives birth standing up and the embryonic sack actually bursts when the baby falls to the ground. Within a few hours of being born, calves can run around and are indistinguishable from a week old calf; however, for the first two weeks, they spend most of their time lying down, guarded by the mother. While adult giraffes are too large to be attacked by most predators, the young can fall prey to lions, leopards, hyenas, and African Wild Dogs. It has been speculated that their characteristic spotted pattern provides a certain degree of camouflage. Only 25 to 50% of giraffe calves reach adulthood; the life expectancy is between 20 and 25 years in the wild and 28 years in captivity. The giraffe browses on the twigs of trees, preferring plants of the Mimosa genus; but it appears that it can, without inconvenience, live on other vegetable food. A giraffe can eat 140 lb of leaves and twigs daily. The pace of the giraffe is an amble, though when pursued they can run extremely fast. They cannot sustain a lengthened chase. Their leg length compels an unusual gait with the left legs moving together followed by right (similar to pacing) at low speed, and the back legs crossing outside the front at high speed. The giraffe defends itself against threats by kicking with great force. A single well placed kick of an adult giraffe can shatter a lion's skull or break its spine. The giraffe has one of the shortest sleep requirements of any mammal, which is between 20 minutes and two hours in a 24 hour period. A giraffe will clean off any bugs that appear on their faces with an extremely long tongue (about 18 inches). The tongue is tough on account of the giraffe's diet, which includes thorns from the tree it is making a meal of. In Southern Africa, giraffes are partial to all acacias — especially Acacia erioloba — and possess a specially adapted tongue and lips that appear to be immune to the vicious thorns. Giraffes are thought to be mute. However, recent research has shown evidence that the animal communicates at an infrasound level. Giraffes are threatened by hunting for their meat, coat and tails. The tail is prized for good luck bracelets, fly whisks and string for sewing beads. The coat is used for shield coverings. Habitat destruction and fragmentation are also threats to giraffe populations. Giraffes are also victims of captivity for human entertainment. Even under the best of circumstances, captivity is cruel for giraffes. Confined to tiny areas and gawked at by crowds, animals in exhibits endure constant stress. They may suffer from temperature extremes and irregular feeding and watering. Without exercise, they become listless, their immune systems are weakened, and they become prone to sickness; many resort to self-mutilation in reaction to stress or boredom. Mental illness is rampant among confined animals. Torn from their families and deprived of all dignity, every part of their lives is controlled by their captors. While zoos and aquariums may appear to be educational and conservation-oriented, most are designed with the needs and desires of the visitors in mind, not the needs of the animals. Many animals in zoos and aquariums exhibit abnormal behavior as a result of being deprived of their natural environments and social structures. When the facility breeds too many animals they become "surplus" and often are sold to laboratories, traveling shows, shooting ranches, or to private individuals who may be unqualified to care for them.